Deck supports seen on one of my bike rides. The other Sunday morning I did one of my slow rambling bike rides. 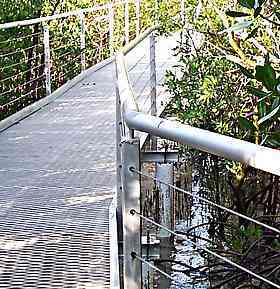 I finished up as I almost always do, along the coast and the spot that I went to had one of our many decks out into the mangroves. Deck supports - General view of the mainly aluminium walkway deck. I love pottering about in the mangrove swamps as they are sometimes called. They are magic places, full of life. When I walked out onto the boardwalk where the tide was running in quite fast, I saw a splash ahead in the surprisingly clear water, and waited a while. Sure enough, almost under my feet a small stingray about the size of a dinner plate cruised along among the roots in the shallow water. Magic, it made my morning. What's this got to do with deck building you may think? well you will see from the second photo that the deck supports are a very simple, but excellent choice for the job that they have to do in this harshest of conditions for a deck. The stump consists of a concrete footing in a hole and concrete is poured into permanent pier forms. That is, lengths of 150 dia PVC pipe. Neat eh? I reckon that for anyone building a deck on short stumps, who has no welding skills and so dosen't want to use steel, these are ideal. Heaps better than timber posts in the ground or on brackets. 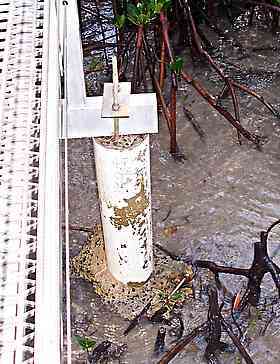 An extremely simple yet very strong connection from the deck beam to the footing below via two threaded rods. In this case the rods are stainless steel but Galvanised in normal conditions would be fine. I don't't know if the rods are the only rebar in the stump or not, but the two would probably be OK for up to 600 high. I guess it this way would be easy and cheap if you could get some recycled pipe from somewhere. Another similar option is to use hollow concrete blocks for your piers. Of course on a garden deck the support posts would be kept inboard as in normal designs, not like here where they stick out at the sides. This would have been done this way to give the guys building this deck plenty of leeway in the set out of the stumps. We have over 8m. tides on occasions and those guys would have had to work fast. Do you get the impression that I hate seeing timber close to the ground, especially hidden out of sight and not getting any maintenance? Yeah, you're dead right! Go To Top :Deck supports.